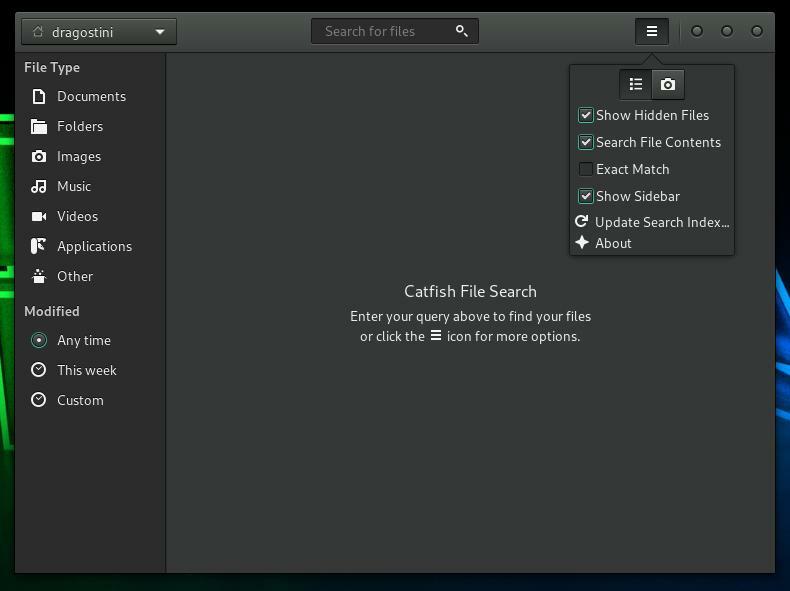 In previous articles, I've discussed how to search for files through other means, like using the command line, but I thought I'd give a quick review of the GUI search tool, Catfish. Sometimes, I really and truthfully just don't feel like popping open a terminal, and locating a file. Sometimes, I really just want to click around with my mouse, even if its typically slower. Note: Jack Wallen reviewed Catfish in 2009. Check out his article for additional information and find out what changed in the nine or so years since. Installation of Catfish is pretty straightforward in most distributions simply using your package manager of choice, although as far as I am aware, Gentoo users will not have Catfish in portage and will need to find a separate overlay for it. In the top left corner of the screen, is a dropdown box for quick and easy directory changing for your searches. The search bar in the top is for your search terms. One of the things that I love most about Catfish, is simply how fast it is. In my experiences, because it uses find and locate in the background, its extremely efficient at finding files in the blink of an eye, without using much in the way of resources, slowing down your system in the process. Even doing a search simply for 'conf' on my laptop, which produced over 4000 results in less than 30 seconds, didn't slow it down whatsoever while Spotify, Firefox, LibreOfice, and a bunch of other things on the go all at once were all continuing without a hiccup. 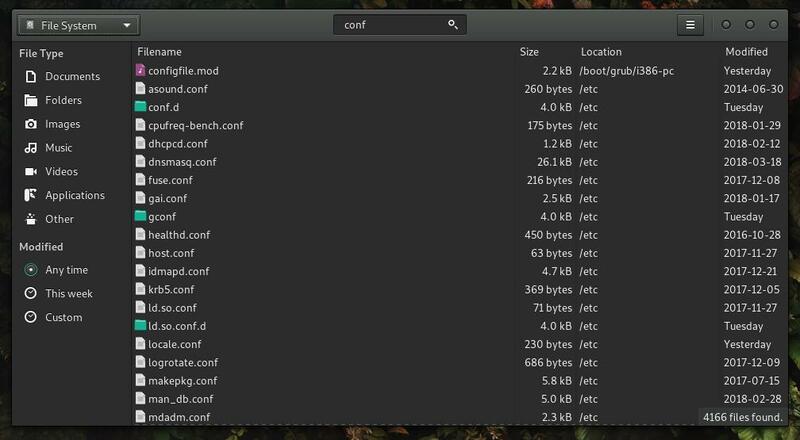 If you're looking for a simple, straightforward, no frills, nice and fast and easy to use search application for your system as an alternative to more clunky programs, or the mess of a terminal, Catfish might be up your alley. I don't really have any negatives to state about it, from my usage. Now You: What do you use to search for files, or the contents of files, in terms of graphical tools? Let us know in the comments! Perhaps interesting for Mint, Ubuntu, etc. users: there is a PPA with “stable, development, and daily builds of Catfish”, maintained by the “‘Catfish Maintainers’ team”. The daily builds are very recent, but have the same version number as the stable build (1.4.2), which was release released two years ago. Perhaps there is a detailed changelog of the various 1.4.2 builds somewhere. The most recent Catfish version is 1.4.5 (source code only). Some users may also wish to investigate the versatile search feature of Double Commander, a double panel file manager. Very simple yet powerful tool for users. The black background will keep me far far away. Why won’t the developer jerks provide other options? are you serious? it doesn’t come with a black background. it depends on the GTK theme you have installed. Works simple & great . for my Ubuntu 14.04 – 32bits). using asterisk * wildcards / regexp?. And it’s been around for a looooooong time. I’ve been using it since it came out in fact.